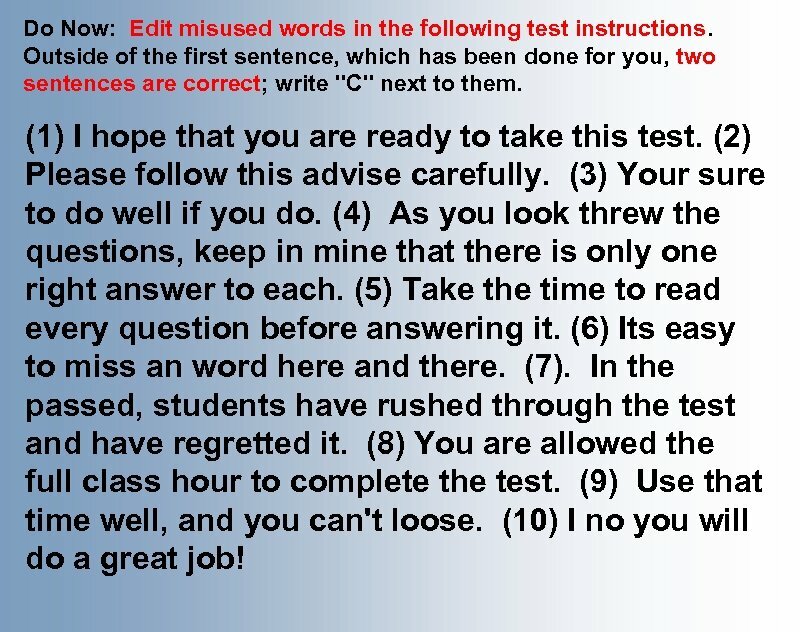 Do Now: Edit misused words in the following test instructions. 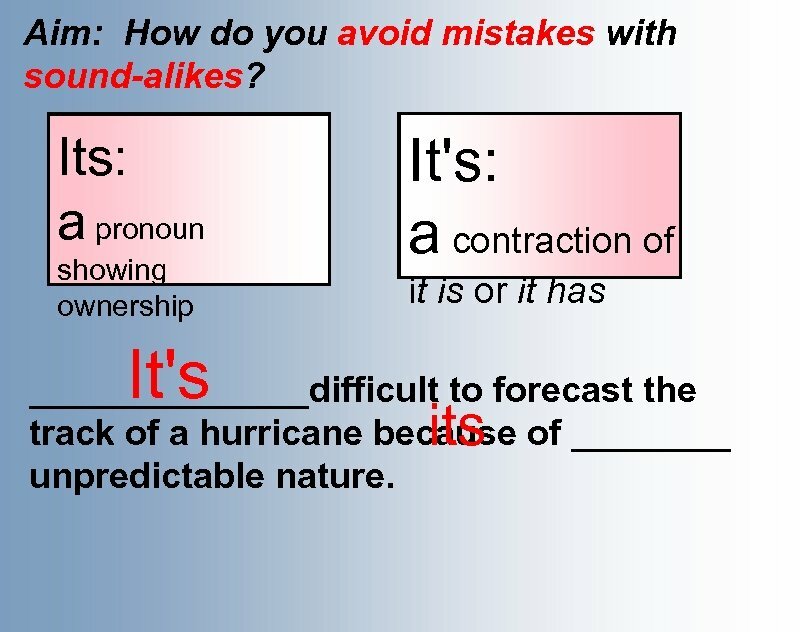 Outside of the first sentence, which has been done for you, two sentences are correct; write "C" next to them. (1) I hope that you are ready to take this test. (2) Please follow this advise carefully. (3) Your sure to do well if you do. (4) As you look threw the questions, keep in mine that there is only one right answer to each. (5) Take the time to read every question before answering it. (6) Its easy to miss an word here and there. (7). In the passed, students have rushed through the test and have regretted it. (8) You are allowed the full class hour to complete the test. (9) Use that time well, and you can't loose. (10) I no you will do a great job! 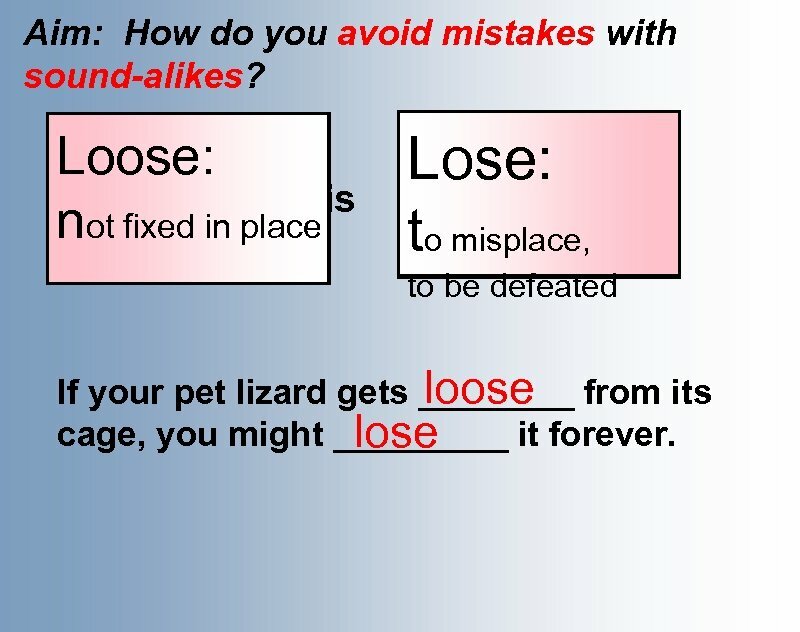 Aim: How do you avoid mistakes with sound-alikes? A large brown bear pawed the tent An egg on toast is delicious for breakfast. A An Patricia and Dylan dated for three months. And a You will find ____ job if you have an ______ impressive resume and ______ good skills. 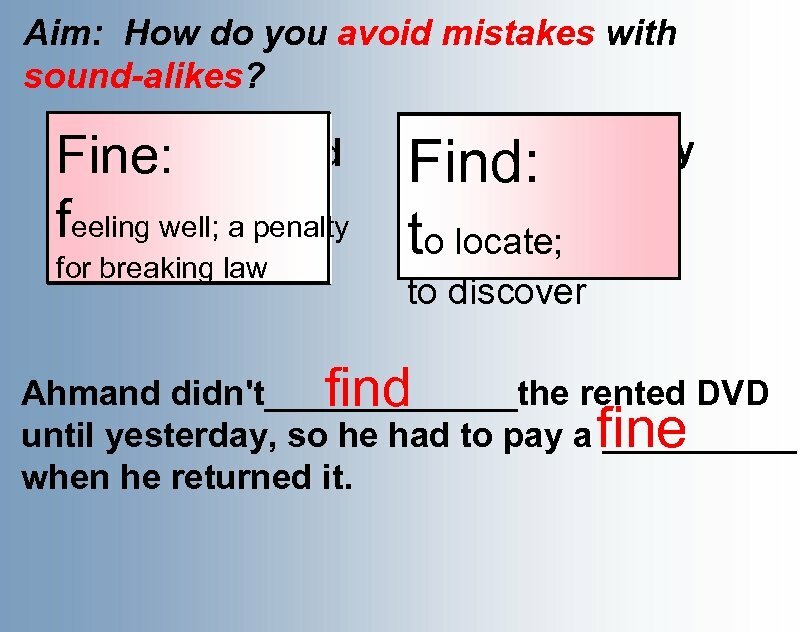 Aim: How do you avoid mistakes with sound-alikes? Please accept my Accept: sincere apology. 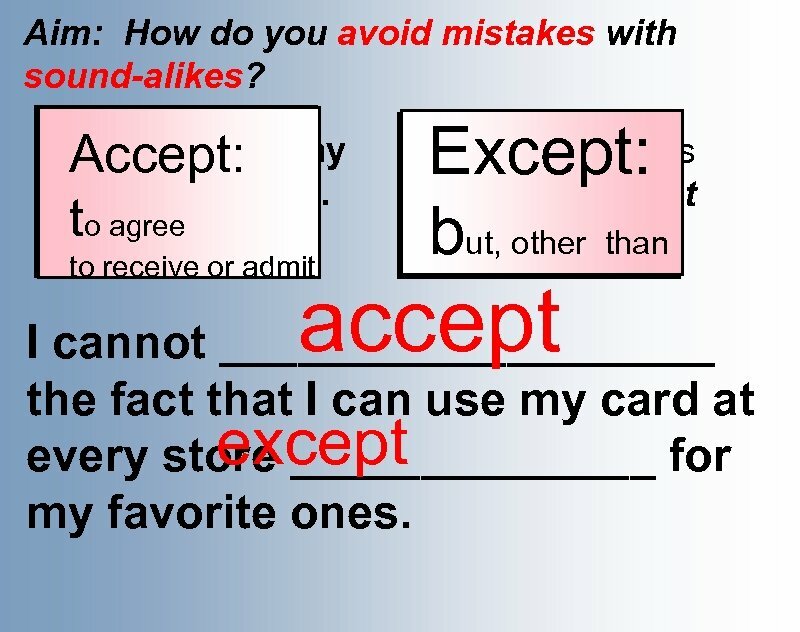 to agree to receive or admit Except: b I like all the songs on the CD except the ut, other than last one. accept I cannot __________ the fact that I can use my card at except every store _______ for my favorite ones. 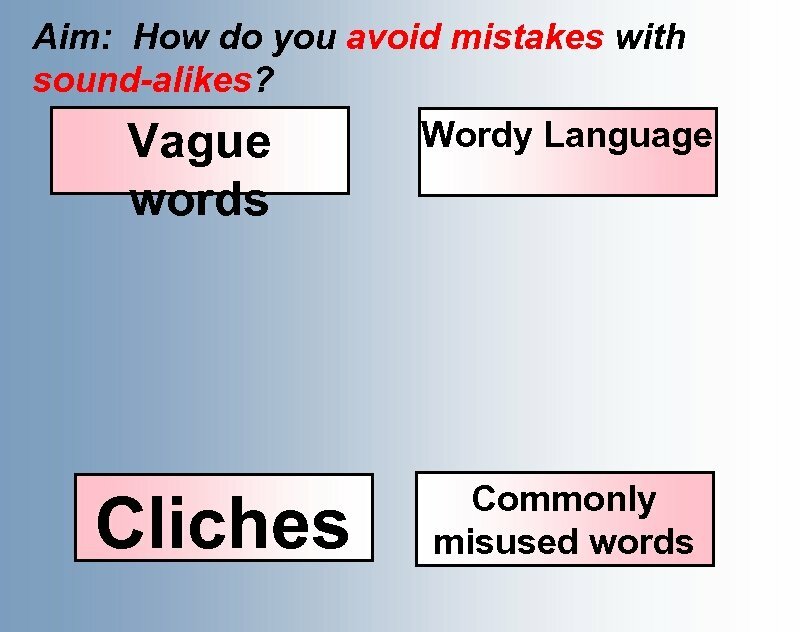 Aim: How do you avoid mistakes with sound-alikes? Advice: o Can you give me some advice about which class to pinion take? A park ranger advised us not to approach wild o give an opinion animals. 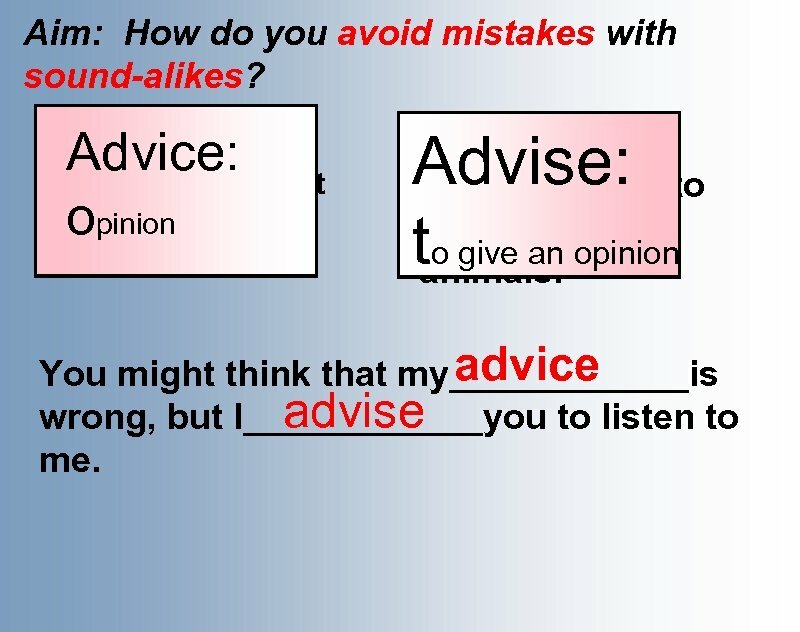 Advise: t advice You might think that my______is advise wrong, but I______you to listen to me. 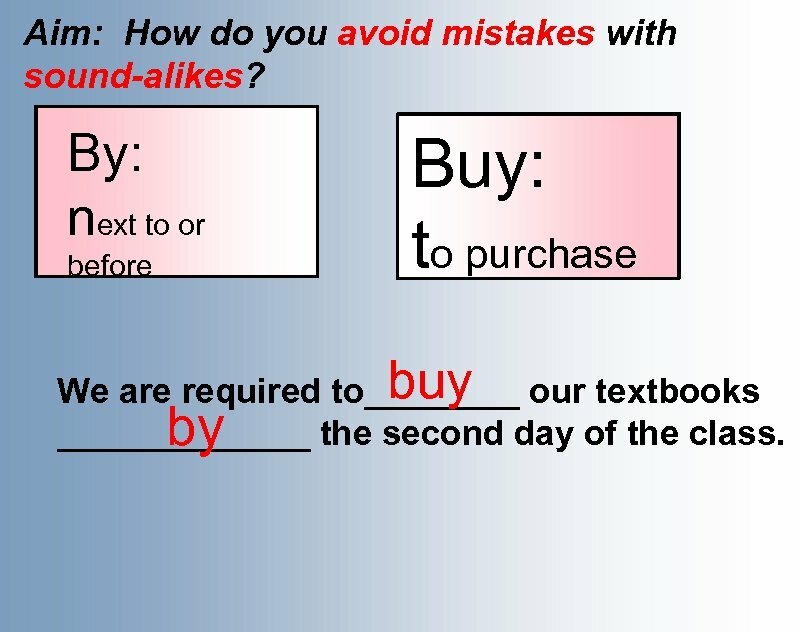 Aim: How do you avoid mistakes with sound-alikes? Affect: t Effect: a effects The realistic special______ in The rising gas prices will affect our vacation impact o make an plans. The drought will have an effect on the crops. result affected the film deeply_____the audience. 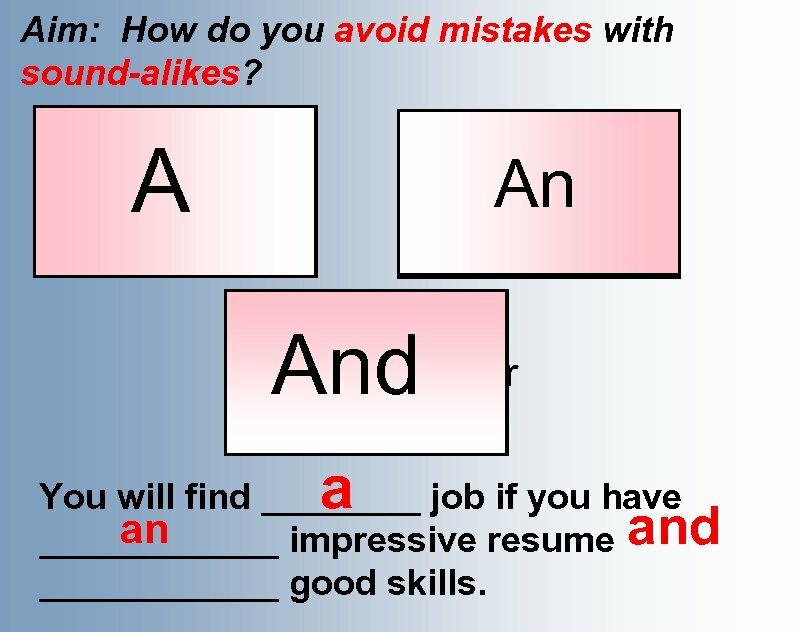 Aim: How do you avoid mistakes with sound-alikes? Are: Those roses are beautiful. 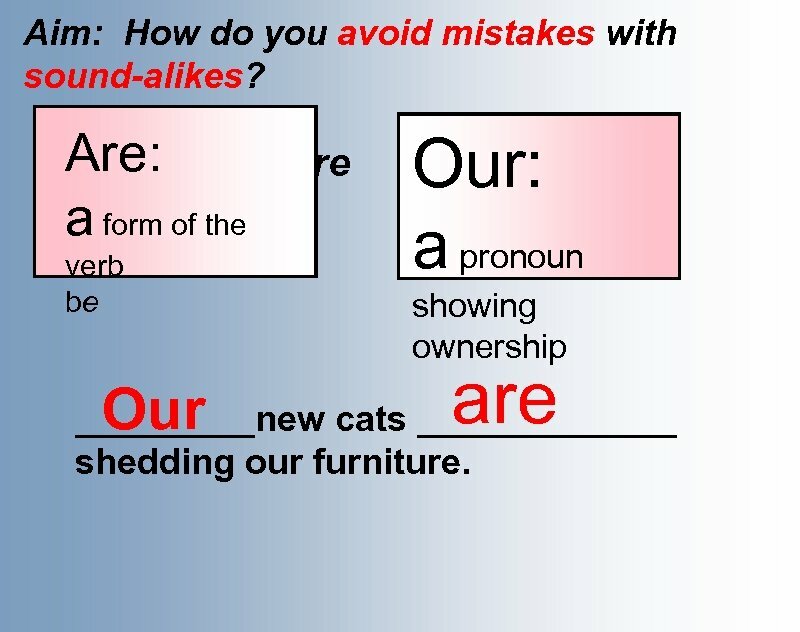 a form of the verb be Our: a pronoun Have you seen our new car? showing ownership are _____new cats _______ shedding our furniture. 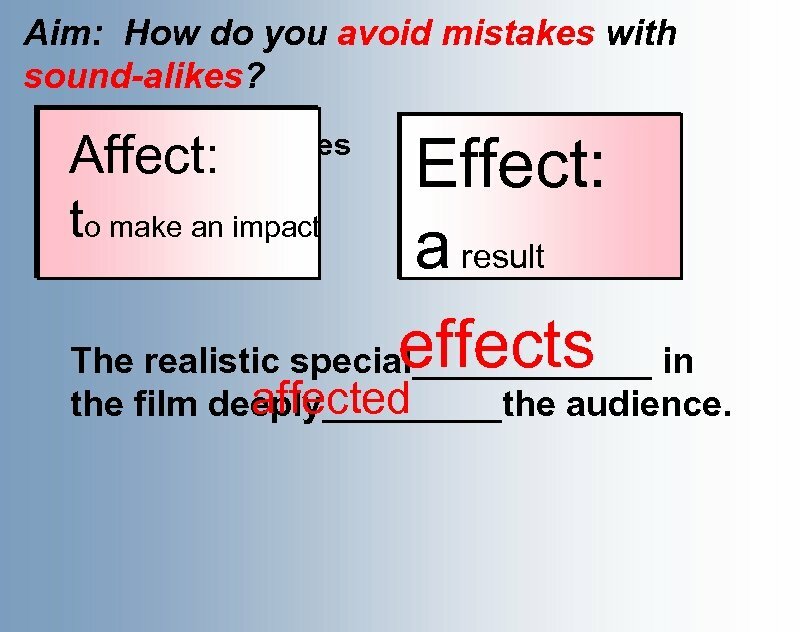 Aim: How do you avoid mistakes with sound-alikes? Her conscience Conscience: made her do the personal sense of right thing. right and wrong Conscious: a I became conscious of the noise in aware wake, my car. 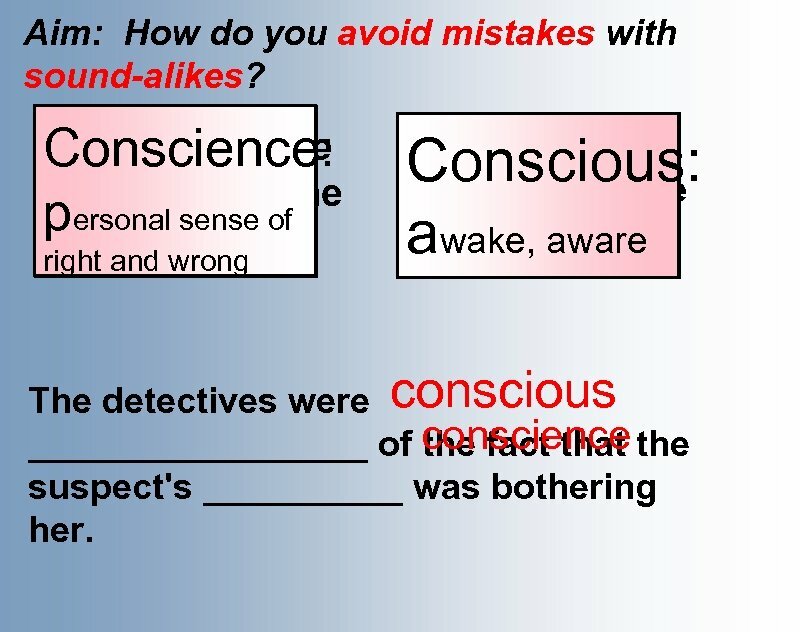 The detectives were conscious _________ of conscience the fact that suspect's _____ was bothering her. Aim: How do you avoid mistakes with sound-alikes? One of the Of: puppies is coming from; already weaned. cause by; part of Have: t We have two dogwood trees in our yard. o possess have We should ____ asked oneof _______ the security guards for directions. 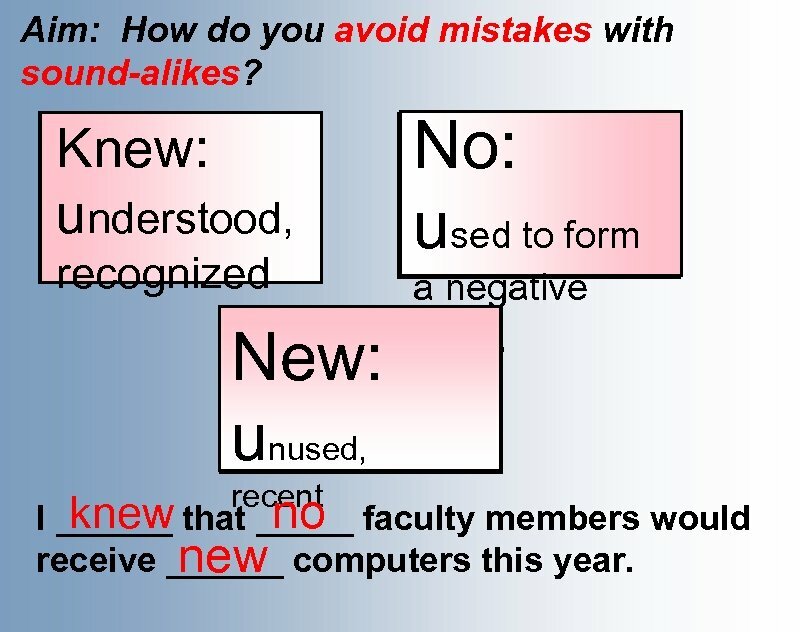 Aim: How do you avoid mistakes with sound-alikes? 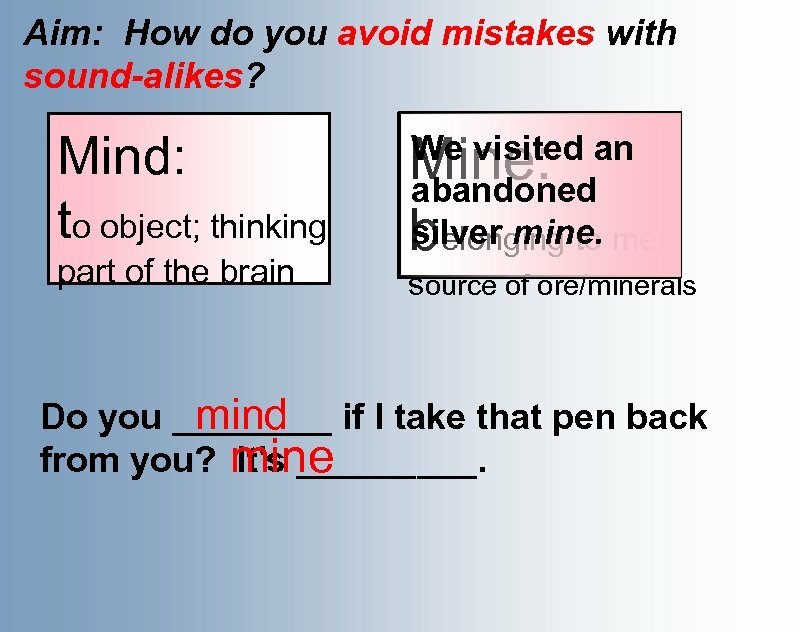 Do you mind if Mind: I change the to object; thinking channel? part of the brain Mine: b That cell phone We visited an is mine. abandoned silver mine. me; elonging to source of ore/minerals Do you ____ if I take that pen back mind from you? mine It's _____.